Batman is 75 years old this year. To celebrate I shall be posting a Bat Cave full of reviews and articles dedicated to The Dark Knight. The third of these reviews is the follow up to 1989’s Batman, Batman Returns. Batman Returns is a much darker, twister sequel to the original Batman film and in some respects surpasses the groundwork made by Tim Burton in the first film. Batman (Michael Keaton) faces the Penguin (Danny Devito) – a warped and deformed individual who is intent on being accepted into Gotham society from his sewer like home. Crooked businessman Max Schreck (Christopher Walken) is coerced into helping him become Mayor of Gotham and they both attempt to expose Batman in a negative light. Selene Kyle (Michelle Pfeiffer), Max’s secretary, is thrown from the top of a building and is transformed into Catwoman – a mysterious figure who has a personality disorder which makes her entanglement with Bruce Wayne all the more complex. Batman must attempt to clear his name, all the time deciding just what must be done with Catwoman. 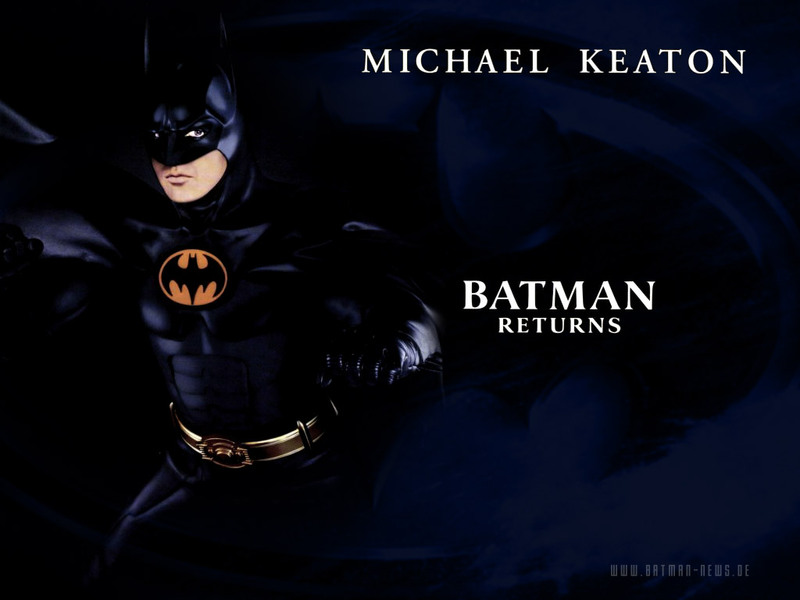 Batman Returns is a much darker film than the previous movie. It feels grittier and less fantasy orientated than the previous film. Not only do the sets feel darker and grimmer but a good deal of the action takes place in the sewers beneath Gotham. This adds an extra dirty feel to the film which is enhanced by The Penguin’s dirty and dejected appearance and his sadistic mind which implies that if you live in dirt you become dirt as Penguin had become. Penguin’s fixation on proving himself to not be a dirty, underhand blackmailer is the thing that moves the plot along. Like the Joker’s attempts to take control of Gotham’s underworld in the previous film Penguin’s attempts to become the centre of Gotham’s social elite drives the plot along and when, like Frankenstein’s monster he is rejected and not given what he wants, he reacts violently and nearly destroys Gotham. The parallel between the Monster and Penguin is only the reaction people have to them; while the Monster is corrupted by humanity’s negative reaction to him Penguin is already on the wrong side of the law and whereas the Monster could be seen as an antihero The Penguin is most certainly an outright villain. The acting in the film is brilliantly done and all the cast play their parts exceptionally well. Keaton’s Batman continues to have more heart than other versions of the character and we know that he really does care for Selena Kyle and would give up everything for her which other versions of the character most certainly would not. Keaton’s Batman is more rounded and sociable than any other and this makes him more human than other versions of the character. He is driven more by attempting to make the world better than just vengeance. Equally Devito’s Penguin is wonderfully sinister and dark. He can give a real shiver down the audience’s collective spine with his hideous grin and sadistic tone. Devito makes the character completely unlikable which isn’t a bad thing as we are lead to believe that because he has lived in such toxic circumstances he has become a toxic person. Pfeiffer also creates a fantastic character with Selena Kyle/ Catwoman. The double personalities that she has are excellently played by Pfeiffer. As Kyle before she is attacked by Schreck we see her as a nervous, skittish character who after the symbolic fall through a cat on a billboard becomes more dark and menacing, rather like Penguin but with more style and apparent hatred of Batman. This double life is played perfectly by Pfeiffer who makes us believe in the character and her split personality and makes both personae an opposite of one another but also makes them similar enough for us to believe they could be the same person. All in all, Batman Returns is a fantastic film with excellent plotting, acting, directing and music from Danny Elfman. The film ends on a less triumphant note than the previous movie and this combined with the darkness of this film lead to Warner Brothers wanting to make the next film more children friendly and in the process made one of the biggest mistakes in movie history.